Dr Charlotte Maguire was born in Indiana in 1918 and grew up in Orlando, Florida. She graduated from the University of Arkansas medical school in 1944 and opened a pediatrics practice in 1946, returning to the state of Florida. Not only was she the only woman in her medical school class, she also was the only woman to serve on the Founders Committee at the University of Florida, appointed by President Tigert (who served from 1928-1947). 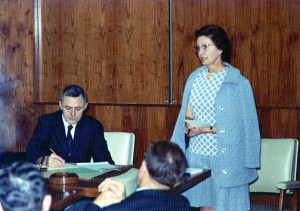 She served on this committee, that met regularly to discuss and plan for the needs of a college of medicine, as a relatively recent graduate who could introduce the older members to new developments in medical education. More recently, Dr. Maguire became involved in founding the College of Medicine at Florida State University, and thus is one of the few people to participate in founding several of Florida’s medical schools.